Disney seems to be high on live-action remakes! ‘The House of Mouse’ is reportedly remaking its 1996 classic The Hunchback of Notre Dame. As Deadline reports, Tony-winning playwright David Henry Hwang has been roped in to pen the new live-action musical, alongside Alan Menken and Stephen Schwartz to compose the music. Although, casting decisions have yet to be confirmed, the live-action revamp of The Hunchback of Notre Dame is co-produced by Mandeville Films along with Josh Gad. Based on the novel by Victor Hugo, the story tells the tale of Quasimodo-a lonely hunchback who lives in the bell towers of Notre Dame and has only gargoyles as friends. He soon meets a beautiful gypsy named Esmeralda and goes on to defend her from the evil Frollo. The new film is inspired from the 1996 animated film and the Hugo novel but not the stage production that Schwartz and Menken collaborated on in Europe. David Hoberman, who runs Mandeville with Todd Lieberman, has been fixated on a live-action remake of Hunchback for over 30 years when he was Disney film president. An early attempt led to the animated film and another resulted in a limited TV series on ABC. Now it has returned as a feature film, The Hunchback of Notre Dame has some of the most storied players from the stage and musical realms. Gad teamed with Menken and Schwartz on a huge Universal deal several years ago for an original musical with Jeremy Garelick. 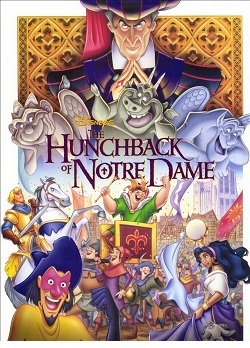 The animated movie of The Hunchback of Notre Dame featured a star-studded cast, including Tom Hulce as Quasimodo, Demi Moore as Esmeralda and Jason Alexander as the gargoyle Hugo.